Want to go faster? Try the Zipline Canopy Tour – yes please! Bristol Mountain also added a new mobile adventure park and two additional aerial park courses. If you haven&apos;t been to the Aerial Park before, you will be in good hands as the staff is excellent. They will show you the ropes (pun intended) and will make sure you have the best experience possible. For veteran aerialists, a new adventure awaits. Last summer, I was fortunate enough to join a few of my fellow FLVC Insiders in the tree tops. We had a blast. It’s hard to explain in words how awesome the experience was, but this video does "vocalize" our excitement. Listen closely. 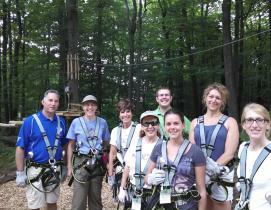 The aerial park is an open book for adventure in the Finger Lakes. If you have ever read a choose-your-own-adventure book, the Bristol Mountain Aerial Park is just that. Are you ready to make the climb? If you&apos;re not into climbing maybe wake boarding is your calling. Check out Bristol&apos;s newest addition, the Roseland Wake Park, which opens in late June. It&apos;s the first and only wake park in the Northeast. Count me in on that! In the meantime we&apos;ll see you on the mountain.